There are numerous articles online that explain how to figure out whether your partner is the right man for you, but there are not that many helpful articles for men. Sometimes, you just know that she is the right for you, but sometimes it is difficult to find out whether she is sticking around because of you. 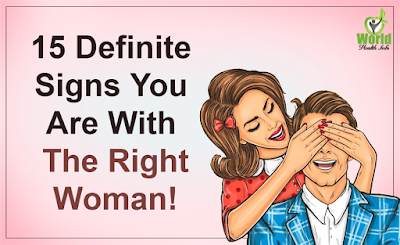 If you are having doubts, keep reading to find out which are the 15 definite signs you are with the right woman. She might tease or mock you when you are alone, but she will never do that in public, especially around people you know. She will respect you because she knows she should never make fun of you in public. No man likes when his woman flirts with other men, especially if they are attractive. Both partners should equally be responsible when it comes to showing respect towards each other by refraining from flirting with other people. A woman who loves you will never put you in such situation. As long as she gets all the love she needs for you, she will never seek for someone else’s attention. Lots of people are self-entitled who think the world revolves around them and they are often egoistic and arrogant. But, if your partner lives you she will always be down to earth, because she knows that nobody should tolerate such behavior. Space is extremely important in a relationship. If she is perfectly fine with letting you spend the night out with your friends, she is definitely the right woman. Sometimes we are clingy at the beginning of a relationship but this behavior should not continue in the other stages. This is one of the clearest signs the is the right woman for you. Since we are often blinded by love, it is easier for other people around us to notice something is wrong. However, if your friends approve of her, she is definitely a keeper. Men love having a partner who is independent and who they can rely on in difficult times. She is also a woman who does not depend on you financially and she is fine with splitting a bill as well as buying you presents. This might seem like a materialistic aspect, but when we look at it from a healthy perspective it can tell a lot about your partner. She doesn’t have to buy you something expensive, it can be as simple as a pair of socks. However, it is the thought that counts and that she wanted you to have something from her. It is also a clear sign she is not a gold digger. Healthy relationships require honesty and trust, and if she doesn’t keep anything a secret from you, such as her social media accounts or her phone, she does is not doing anything behind your back that might hurt you or make you feel disrespected. This might seem strange, but it is very true. If you leave her, she will not turn into an obsessive stalker. She will respect your decision and will never disrupt your future life. A health relationship also involves healthy intimate moments. This woman will not be afraid or ashamed of exploring her fantasies and making you a part of them. As long as they are not outside the limits of bizarreness, or something degrading, you might try to make them enjoyable for both of you. This is one of the most important things in a relationship. Being compatible with your partner means being compatible with your behavior, personality and lifestyle. If you also share the same goals, you have definitely found your ideal partner. If she knows the difference between choking you or giving subtle reminders about herself every now and then, she is the right woman for you. Also, if you feel pleasant any time you get a message from her, it means she definitely is a keeper. The ideal woman will never be afraid of sharing her opinion especially if it is different from other people’s opinion. She will be confident about her thoughts and will prefer if you accept her for who she is, not who you want her to be. Sometimes women can be extremely obsessive and can test their partner’s limits. If she is aware that you love her, she will cut you slack and forgive occasional mistakes since she knows you are a human being after all. She will never accuse you of not being perfect. If she wants to make eye contact with you, she definitely loves you. If you catch her looking at you, or if a third party paid attention to how she looks at you, you will be certain that she loves you a lot.